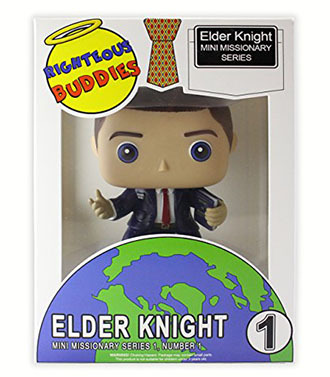 Righteous Buddies is a line of Mormon toys, designed to look like Funko Pops. They’ve currently only got Elder Knight and Nephi. It’s impossible to say whether these are better or worse than the Pickle Rick Funko Pop, a second Pickle Rick Funko Pop, the Rick Funko Pop, a different Rick Funko Pop, or anything else where oil is pumped, refined, polymerized, molded, and printed in order to sit on a shelf.